I have been exploring how very simple algorithms might be able to generate complexly interrelated lines of great beauty. I’ve been writing code hoping to be surprised, and sometimes succeeding. I have been sharing them on Facebook, Instagram, Twitter, Tumblr, and Ello, a further experiment in dissemination. I’m not the first to make code drawings. I’m making them with tools few others would think to use. Hopscotch is an app for the iPad. It provides a block-based visual programming environment that was inspired by Scratch. It uses a touch, swipe-to-drag and drop interface. It includes resonances with Logo, Design By Numbers, Processing, and Scratch through a “pen” entity that is plotted in two dimensions with either direction and stepping, or changes in X and Y values. It has been designed with very young learners in mind, and affords the kindergarteners the opportunity to program for touch interfaces. 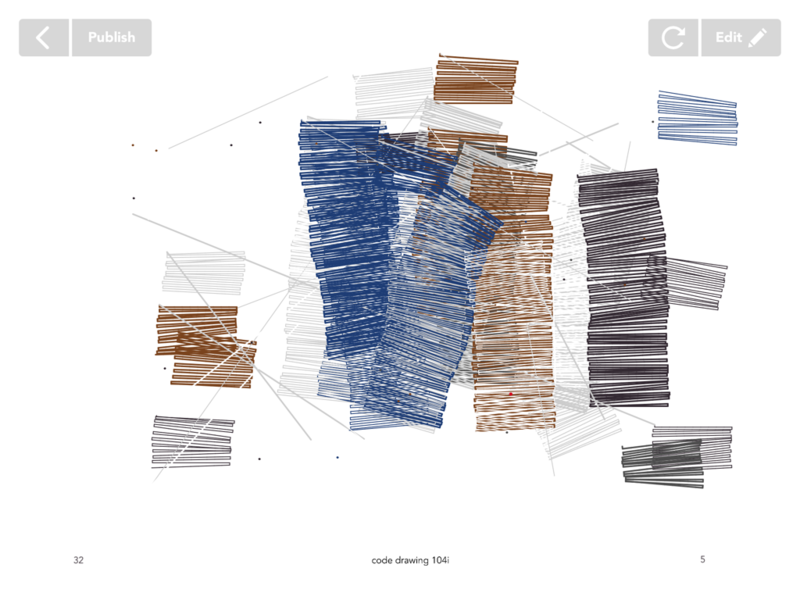 I have been making drawings with small algorithms, the smallest ones possible. I’m following a self-discipline where I am trying to minimize the size of the algorithm. I am also trying to retain the legibility of the the code, its intelligibility. At first with as few sprites as possible, and then with a single sprite and clones when that became possible. I’ve introduced small possibilities for variability in the lines. I’m hoping to give them some liveliness. code drawing 104i was one of the ones I shared on Tumblr, Instagram, and Twitter. It caught the attention of the Hopscotch team who then featured the program on their social network. That was some time in August of 2015. As of this writing that project now has surpassed 30,000 plays. I think that there are several others that create even greater beauty, but those have enjoyed less notice. Rafael Fajardo has been exploring the expressive potential of the videogames through his creative work. He is the founder of SWEAT, a loose collaborative that pioneered the creation of socially conscious videogames, which have been exhibited in museums and festivals world wide. Fajardo has been engaging in collaborative interdisciplinary research concentrating on learning through game-making. His projects have been funded by the National Science Foundation, the National Endowment for the Humanities, and by the Colorado Council on the Arts, in excess of one million dollars. I.D. Magazine named Fajardo among the top fifty designers in the country in 2004. He currently serves on the Board of Advisors of the International Digital Media and Arts Association, and on the Board of Advisors of Games for Change. Rafael received an MFA in Graphic Design from the Rhode Island School of Design, a BFA and a BA from the University of Texas at Austin.